Field and Stream Team sign that has lived in Jordan’s room since we moved to Clinton Twp in 2007. I was dropping off the kids at K-Rock Summer Camp this morning and chatted with Nancy Andrews Zott before I left. I told her the following story about her grandfather, Dr Chub Andrews. I originally wrote this story down and shared it in an email on April 3, 2007, the week of Easter. I’ve printed it in its entirety below. I hope you enjoy it and I hope it inspires you to look around you with fresh eyes today. “Many of you know that it was the life of Dr Chub Andrews that inspired me to want to try again to have a second child, after our blighted ovum miscarriage and months of unsuccessful attempts. Seeing the legacy he left through his 5 children, grandchildren and great grandchildren made me say, “I don’t need 5 children, but 2 would be wonderful!” Dr Andrews died in July 2005 and was memorialized at a weekend service at Kensington Community Church in August 2005. We had given up trying that April and had decided that Joshua would be an only child. But after that service, we talked and began praying about trying one more time. When we finally said, “Yes, we will try again,” Jordan was conceived about 3 days later. She was God’s plan, His timing, His idea. I was looking for some boxes in the basement a few nights ago, so that I could start packing up our house to get it ready to sell. What I thought was a box, was actually a couple pieces of cardboard taped together to protect something inside. I pulled out what was inside – a 2 x 3 foot sign advertising the very first Kensington Field and Stream event, held at Bass Pro Shops at Great Lakes Crossing. 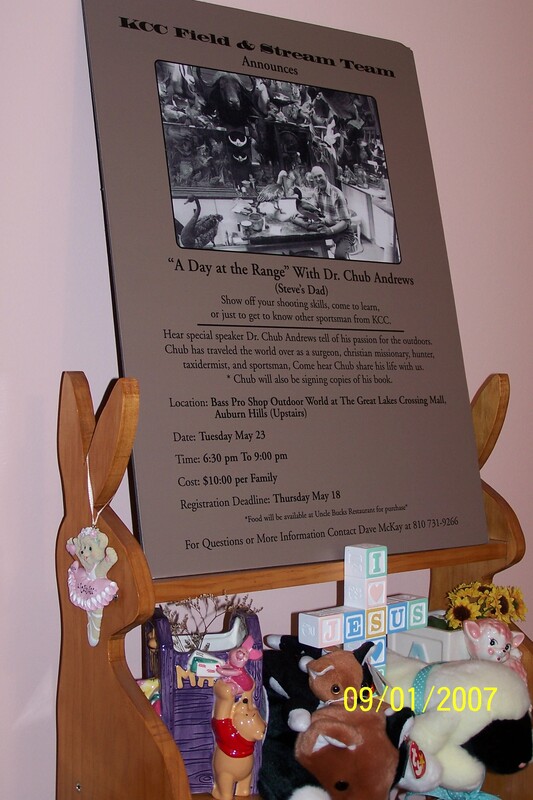 It was “A Day at the Range with Dr Chub Andrews” and it had a lovely picture of Chub sitting in his taxidermy room, surrounded by the many mounts he had done with his own hands, with the most lovely, bright shining smile on his face. Then I looked down at the date. Tuesday, May 23. That was the year 2000. Six years later, on Tuesday, May 23, 2006, Jordan Rose Bacarella was born. How amazing is our God! He wanted this little girl to be born. He used Dr Chub Andrews to inspire us to try again. He knew the date and the day of the week that she would be born. Even that date was a miracle. Jordan was originally scheduled to be born on Wednesday, May 24 with another doctor. I had done all I could to try to schedule her birth with Dr Huston, who also delivered Joshua, but the dates and Beaumont’s O.R. schedule just didn’t jive. But then I got a phone call that there just happened to be one opening on May 23 with Dr Huston and I could have it. “Just happened.” There is no such thing as a coincidence – they are ALL God-incidences, as Gwen Shamblin used to say in her lovely southern accent. Godcidence. Amazing to experience. Live life with eyes, ears and heart wide open, and just “be with” … Him. No such thing as coincidence. Beth, you are my latest Godcidence. Blessed!